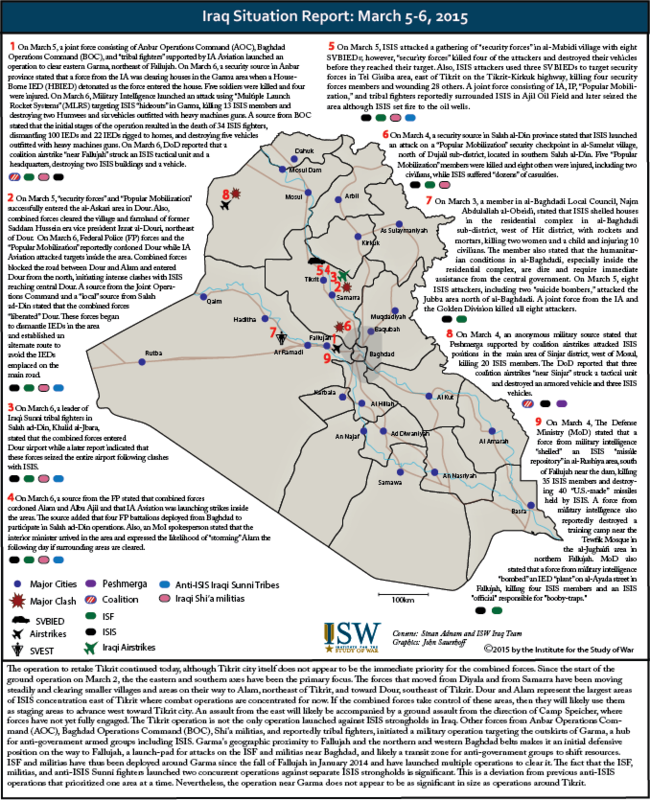 SW will continue to provide updates on the situation in Iraq as it unfolds. For continuous updates, visit iswiraq.blogspot.com. The operation to retake Tikrit continued today, although Tikrit city itself does not appear to be the immediate priority for the combined forces. Since the start of the ground operation on March 2, the the eastern and southern axes have been the primary focus. The forces that moved from Diyala and from Samarra have been moving steadily and clearing smaller villages and areas on their way to Alam, northeast of Tikrit, and toward Dour, southeast of Tikrit. Dour and Alam represent the largest areas of ISIS concentration east of Tikrit where combat operations are concentrated for now. If the combined forces take control of these areas, then they will likely use them as staging areas to advance west toward Tikrit city. An assault from the east will likely be accompanied by a ground assault from the direction of Camp Speicher, where forces have not yet fully engaged. The Tikrit operation is not the only operation launched against ISIS strongholds in Iraq. Other forces from Anbar Operations Command (AOC), Baghdad Operations Command (BOC), Shi’a militias, and reportedly tribal fighters, initiated a military operation targeting the outskirts of Garma, a hub for anti-government armed groups including ISIS. Garma’s geographic proximity to Fallujah and the northern and western Baghdad belts makes it an initial defensive position on the way to Fallujah, a launch-pad for attacks on the ISF and militias near Baghdad, and likely a transit zone for anti-government groups to shift resources. ISF and militias have thus been deployed around Garma since the fall of Fallujah in January 2014 and have launched multiple operations to clear it. The fact that the ISF, militias, and anti-ISIS Sunni fighters launched two concurrent operations against separate ISIS strongholds is significant. This is a deviation from previous anti-ISIS operations that prioritized one area at a time. Nevertheless, the operation near Garma does not appear to be as significant in size as operations around Tikrit.